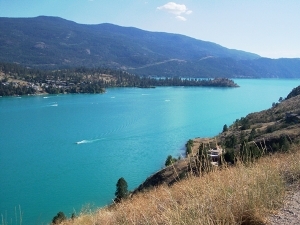 Kalamalka Lake, located at the north end of the Okanagan Valley turns a beautiful greenish/blue color every summer. This occurs because the calcium carbonate (CaCO3) or limestone, precipitates (forms a solid) out as tiny white particles which scatter the light entering the lake and reflect it back as that characteristic blue/green hue. 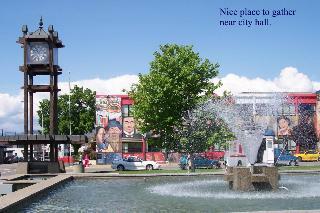 The Okanagan Valley is known as a semi-arid region. 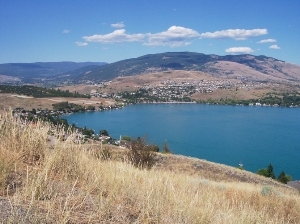 The varied colors of dried out grasses on the hillsides contrast sharply with the Turquoise hue of Kalamalka Lake. 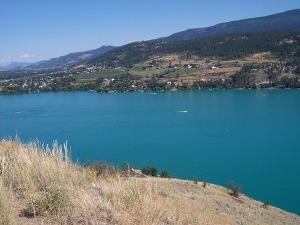 Boaters and swimmers alike are drawn to the magical colors of the Okanagan Valley and Kalamalka Lake.